Journey back in time to medieval towns lined with age old cobblestones, cosmopolitan city’s, and a fusion of sophisticated marinas with stunning scenery; Croatia is evolving into a much sought after location, which is virtually unchanged to the present day. 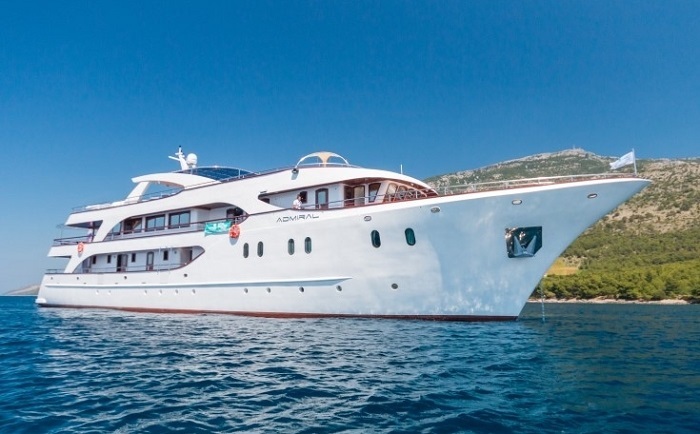 What better way to explore the delights and shimmering waters of this stunning part of the world, than an intimate cruise; slip off your shoes, and relax as you cruise around the jewel like islands of Dalmatia and the coast of Croatia. Our featured cruise ships offer an atmosphere of relaxation and casual attitude, this cruise is all about appreciating a slower pace of life, good food and the company of like-minded passengers, with the chance to spend time on-board, but also experience a little local culture and sample the local cuisine of an evening…. 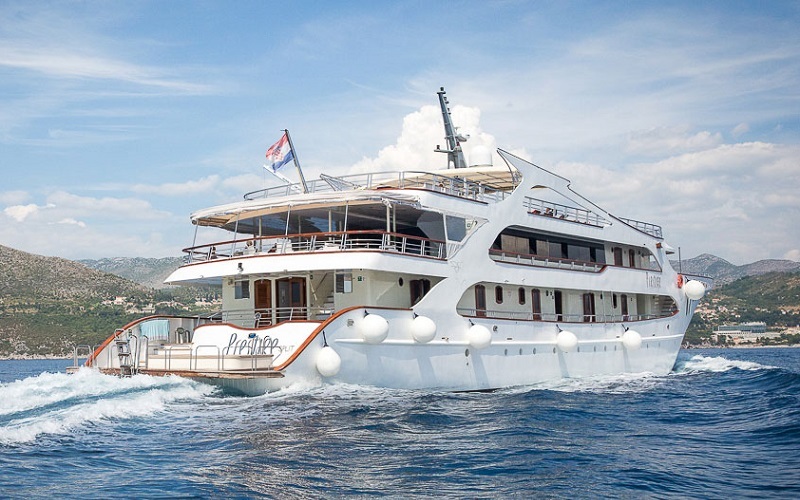 …..Perfect for those who shy away from the more formal cruise and just want to enjoy the un-paralleled rustic and medieval beauty of Croatia without the fuss on-board. Croatia is truly becoming a ‘must visit’ destination. Joining a small fleet of superior cruise ships which offer a private balcony on the upper deck cabins; the M/V Markan enjoyed her maiden season in 2018. This new vessel conveys an air of relaxed sophistication with beautifully toned décor and superb facilities on-board. This cruise simply delivers on all levels. Enjoy the ultimate cruising experience as you sail through the Adriatic with a tentative crew, and a laid back ambience. Perfect! 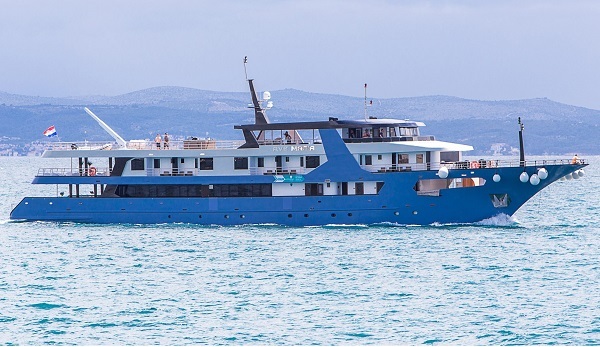 08th May 2019: Balcony Cabins from only £1,995 £1,545** per person. Following the ‘Divine Dalmatia’ itinerary. Commencing, and taking in two nights in Dubrovnik, this itinerary includes culture, gastronomy and history. Also available on selected dates following the ‘Dalmatian Paradise’ itinerary. 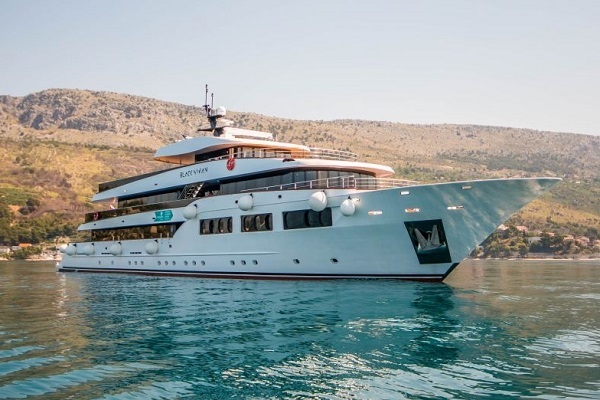 M/S Prestige - 2019 and 2020 Now Available! 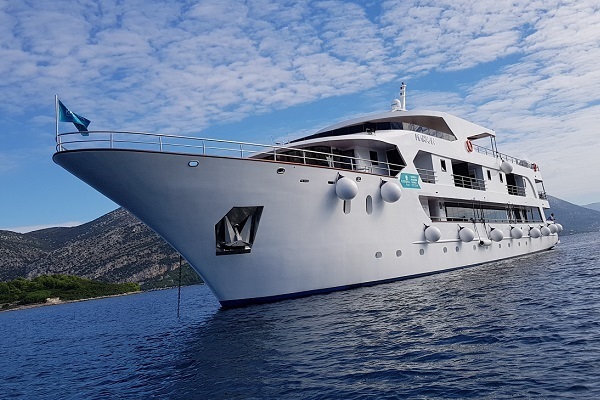 We are pleased to welcome back the M/S Prestige, one of our most popular vessels to date; this fantastic cruiser having undergone a huge refurbishment is back with a great new stylish look. This classic coastal cruise offers contemporary style, together with plenty of living space on-board. You can expect a personal and attentive service through-out your stay, making the M/S Prestige the perfect platform from which to explore the islands and waters of the Adriatic. 2019: Northern Route and Southern Route, 6 Dates From £1,495 per person includes flights, transfers, half board, complementary drink with meals, selected walking tours plus captains dinner. 2020: Now Available..... 9 Dates From £1,545 per person includes flights, transfers, half board, complementary drink with meals, selected walking tours plus captains dinner. This luxury vessel offers private balconies and deluxe on-suite cabins fitted to the highest of expectations. Living space on-board has been thoughtfully designed to truly make the most of a week’s cruising experience; with ample deck-beds for all passengers, fantastic Jacuzzi hot tub, and easy access to swim in the sparkling Adriatic waters. This stunning vessel was new to the 2018 season and proved to be hugely popular. The deluxe superior category of ship is simply epitomised by the Black Swan. Its cool and calming décor is perfect for relaxing on-board. With just 18 cabins this intimate cruise will be relaxed, casual and provide exceptionally high levels of service. Mornings will be spent on the sundeck and outside lounge or dipping into the clear waters from the swimming platform before exploring the islands and marinas at the next port of call. Includes flights, transfers, half board, complementary drink with meals, selected walking tours plus captains dinner. Brand New to 2019, the M/S Yolo will be built and designed mindful of today’s expectations of this level of cruiser. 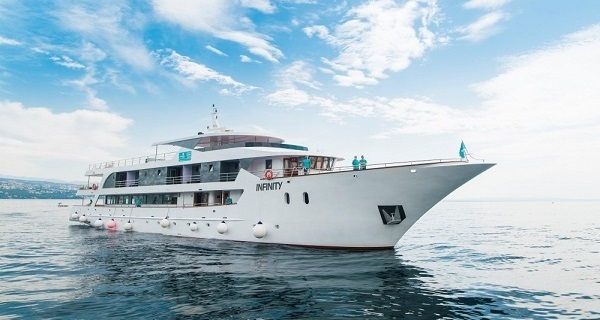 This is the perfect ship to escape the formalities of a larger cruise, with only 18 guest cabins, life on board is relaxed with a laid-back ambience. The M/S Yolo will be ready to sail in April. 21st September 2019 Exclusive to UK2 Travel; heading south following the Dalmatia Discovery itinerary. Taking in Split, Hvar, Dubrovnik, Korcula and Pucisca. From: £1,745 per person includes flights, transfers, half board, complementary drink with meals, selected walking tours plus captains dinner. M/V Admiral - Back for 2019! 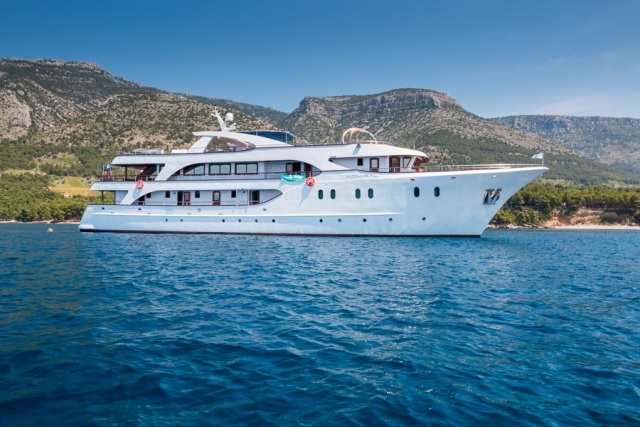 Launched 2015: The M/V Admiral has certainly proved to be amongst the newest and most Deluxe vessel to sail the Adriatic. This outstanding and commanding vessel embarked on her maiden voyage in June, and without doubt offers all the refinement that is expected from such a level of cruiser….the Admiral is perfectly informal with a relaxed feel on-board. Sailing the islands and coast of Croatia on board one of our deluxe cruises is the perfect way to experience this stunning part of the world. From May through to October the deluxe cruise itinerary departs every Saturday, and so gives you a little more flexibility than our exclusive charters. Each deluxe cruise is hosted on a newly built vessel, all with exceptionally high standards which deliver on all levels; from the spacious en-suite cabins, sundecks and public areas to the fantastic crew and guide, all waiting to welcome you on-board. You will be accommodated on-board either of the following vessels…M/S Futura, M/V Aquamarin, M/V Admiral, M/V San Antonio (all of which are featured on our website, and have been previously exclusively chartered by UK2 Travel).